If I were giving product recommendations and advice to someone trying to develop a proper skincare routine for the first time, I don't think I'd make it through the first sentence without uttering the word "Kiehl's." The brand was actually my first true introduction into the world of skincare and it's what got me hooked. I picked up a few of their cult classic products and almost instantly saw a difference in the overall health of my skin. Of course, my skin has matured a bit since then but I still do love the brand and their products are failsafes, in my opinion. 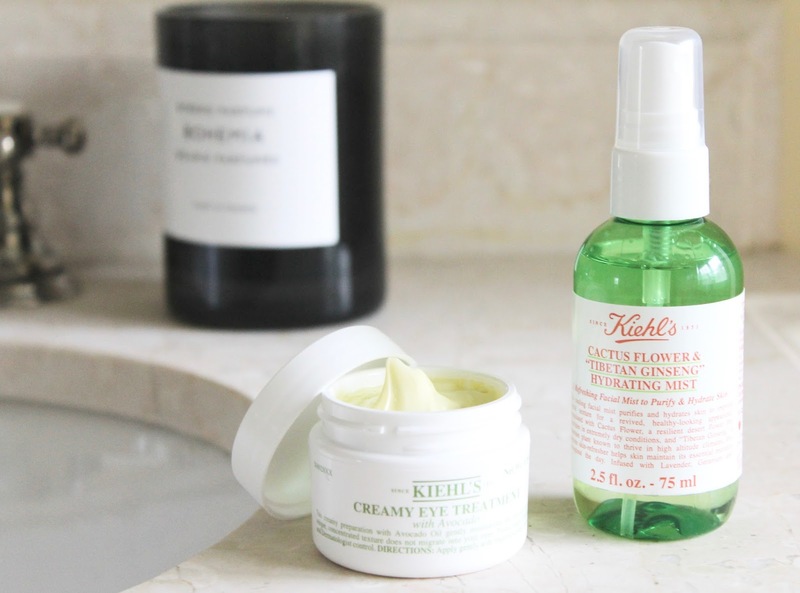 Today, Kiehl's deserves a moment in the spotlight here and I'm raving about a newly launched face mist and an old favorite eye cream that I don't think I'll ever be without. Kiehl's Cactus Flower & "Tibetan Ginseng" Hydrating Mist - You know I have a major obsession with face mists. Well, this addition from Kiehl's is the one I've been most excited about since hearing about it a few weeks back. Upon first spritz it's a fine cooling mist that soothes dry skin immediately, also reviving makeup in it's path. I love the relaxing spa-like scent and that it can be used almost any way you prefer it; as a toner, before or after makeup, and as a refresher throughout the day. The spray contains moisture boosting Cactus Flower, skin refreshing Tibetan Ginseng, and a mixture of essential oils that leave skin feeling smoother, awakened, and of course plumped. The larger size is perfect for your bathroom shelves, and the 2.5 oz. bottle makes for a perfect (TSA approved, yesss) travel companion/skin-revving purse addition. 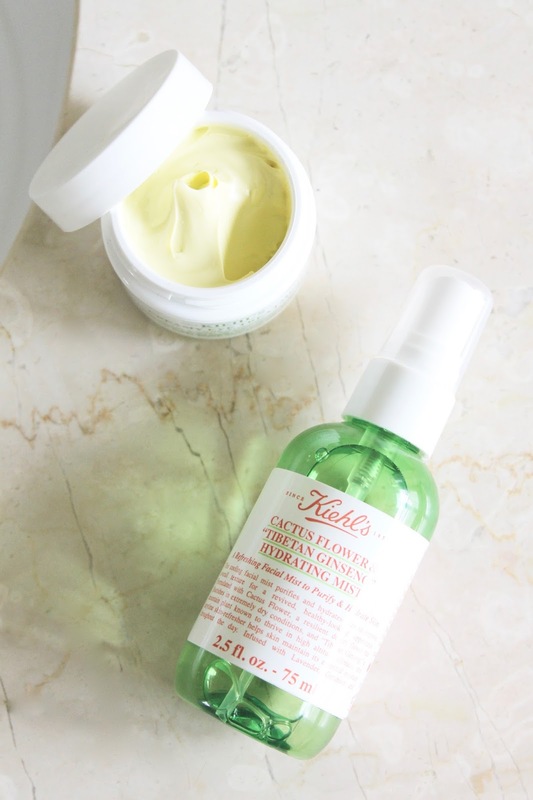 Kiehl's Creamy Eye Treatment with Avocado - If you're unsure of what eye cream to purchase, or never found one you loved, you're in for a treat here. The Creamy Eye Treatment with Avocado is rich, soothing, moisturizing and perfect for prepping for makeup because it sinks in almost immediately. I love how it's so gentle, and thanks to the inclusion of avocado oil, gives a really deep moisture feeling without any tackiness. It's seriously addictive, I use it almost daily to prep for under eye concealer, as demonstrated here. It's the one eye cream that I come back to time and time again.